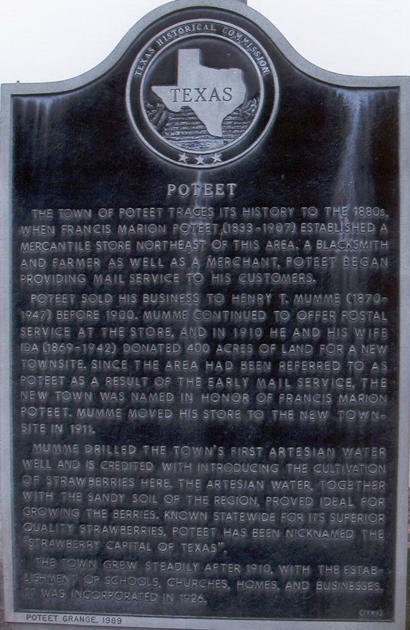 Poteet was named after local blacksmith / postmaster Francis Marion Poteet. The post office opened in 1886 and by 1892 the town had most basic businesses, including a gin, gristmill, and wagonmaker. In the mid 1890s Henry T. Mumme arrived, opened a store and succeeded Poteet as postmaster. Mumme discovered artesian wells in the area in 1902 - even while the region was suffering from a drought. When the Artesian Belt Railroad was building through the area the Mummes donated land to the railroad (three miles southwest of the original site) and built a new store alongside the railroad. Having irrigation from the wells, Mumme planted strawberries and the rest, as they say, is history. A three-day strawberry festival was first held in 1948 and is now an annual event. 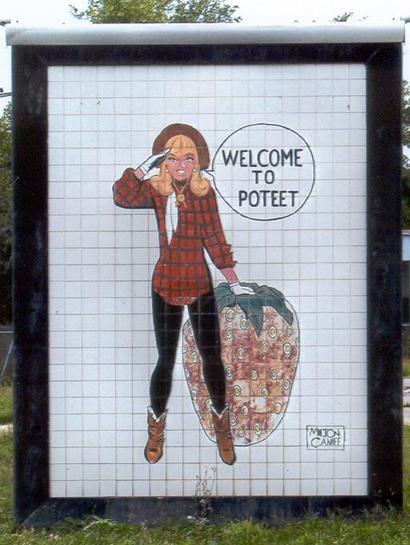 From a population of 500 in 1914 Poteet grew to 2,300 after oil was discovered nearby in the 1940s. From the 1970s, the population stabilized around the 3,000 mark - peaking in the late 1980s at 3,519 and then declining to 3,206 for the 1990 census. The strawberries are NOT shipped in from California. The Poteet Strawberry Festival Association has taken great efforts to insure all strawberries on the grounds are certified to be from the 19 local growers. Outsiders have brought in trailers from California and sold in the city to make a quick profit but have now dwindled. 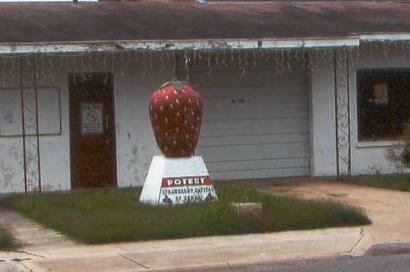 Since the annual event draws crowds in excess of 100,000, the demand for Poteet strawberries is greater than the supply. Unfortunately, outside strawberry markets move into the Poteet area to take advantage of the crowds. The Association has no control of vendors outside the Festival Grounds. However, to assure that our guests are getting the genuine articles, all local berries will be in newly designed boxes which state "Fresh Produce Poteet, Texas" during Festival Weekend. The Poteet growers are also offered locations on the Festival Grounds to sell their berries. The Poteet Strawberry Festival grounds was bought by and maintained by the Poteet Strawberry Association to benefit local non profits and strawberry growers. In 1948 there were over 400 growers. Now there are only 19. Over 33 local non profits sell food and drinks on the grounds. 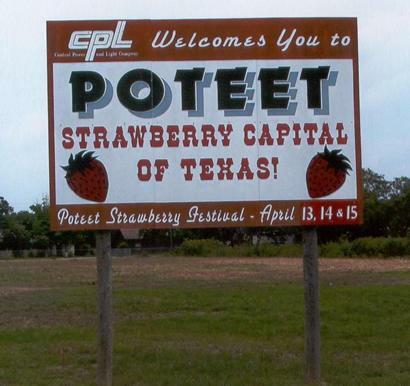 The Poteet Strawberry Festival is the largest agriculturally based festival in Texas., When compared to the strawberry festivals across the nation , Poteet usually is in the top three of the best. 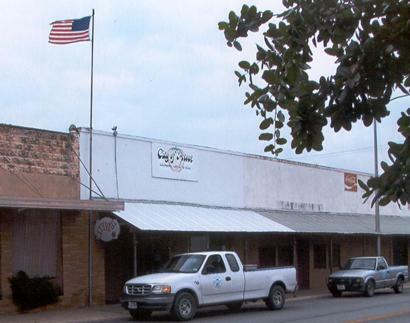 Poteet is also the birthplace of country singer George Strait. 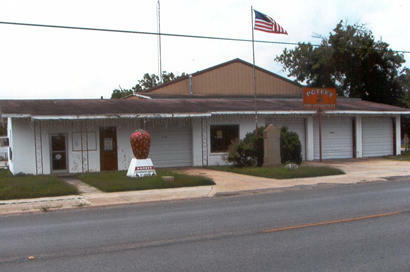 The mosaic in front of the Poteet Volunteer Fire Department is "Poteet Canyon"
Poteet historical marker in front of the post office. 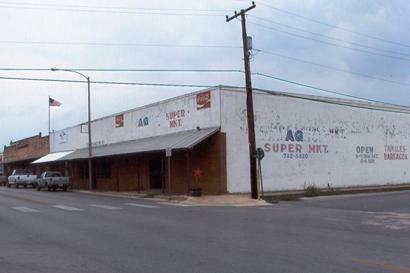 The town of Poteet traces its history to the 1880s, when Francis Marion Poteet (1833-1907) established a mercantile store northeast of this area. A blacksmith and farmer as well as a merchant, Poteet began providing mail service to his customers. Poteet sold his business to Henry T. Mumme (1870-1947) before 1900. Mumme continued to offer postal service at the store, and in 1910 he and his wife Ida (1869-1942) donated 400 acres of land for a new townsite. Since the area had been referred to as Poteet as a result of the early mail service, the new town was named in honor of Francis Marion Poteet. 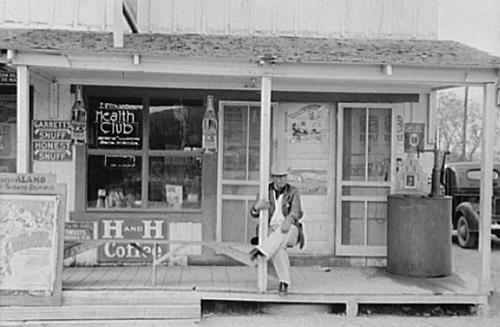 Mumme moved his store to the new townsite in 1911. Mumme drilled the town's first artesian water well and is credited with introducing the cultivation of strawberries here. The artesian water, together with the sandy soil of the region, proved ideal for growing the berries. 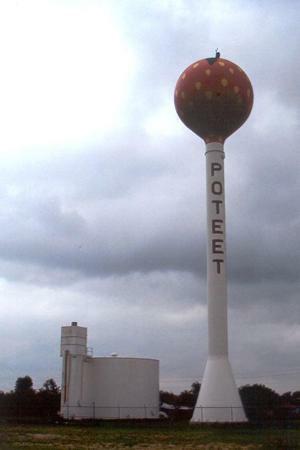 Known statewide for its superior quality strawberries, Poteet has been nicknamed the "Strawberry Capital of Texas." 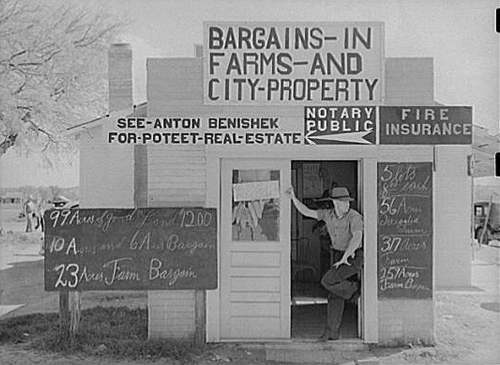 The town grew steadily after 1910, with the establishment of schools, churches, homes, and businesses. It was incorporated in 1926. Tile mosaic in front of the volunteer fire department by artist Milton Caniff. 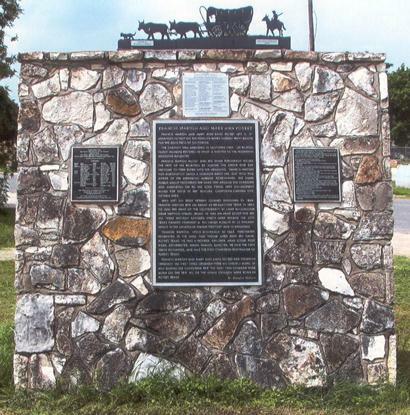 Memorial in front of the fire department, dedicated by Poteet family descendants, to Frances Marion and Mary Ann Poteet and their family. 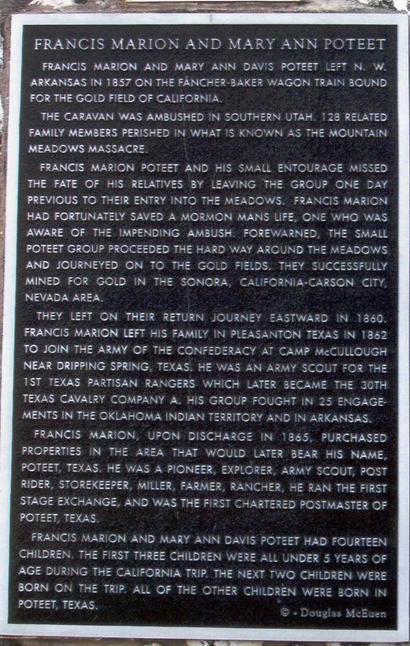 Center plaque on Poteet family memorial.